In the 15th edition of our Developer Economics survey, we asked 8,600+ machine learning developers which data science platforms they use, how satisfied they are and how likely they are to recommend each of these platforms. As you would expect, there is generally a strong positive relationship between developers’ satisfaction and usage for a given platform – the more satisfaction a platform gathers, the more mindshare and recommendation it gets. In this post, we explore the implications of this relationship as well as some of its nuances for third-party platform vendors. The majority of developers use more than two data science platforms. ML developers leverage the specialisation of various platforms to manage different tasks, such as end-to-end model development, data sourcing, algorithm development and model deployment. “Loyalty” is not yet a concept that applies to data science platform users as the product offering is still evolving and there is no single product that answers all the needs of developers and data scientists. This fragmentation is reflected in the usage of and satisfaction with machine learning platforms. The higher the satisfaction and the NPS, the more mindshare a platform gathers from developers. The two polar opposites best illustrating this point are Anaconda and SAS Enterprise Miner. Anaconda is the undisputed leader across mindshare, satisfaction, and NPS while SAS ranks last for both satisfaction and NPS which in turn translates to a mindshare ten times lower than Anaconda’s. Microsoft Azure Machine Learning Studio is Anaconda’s closest competitor for both mindshare and satisfaction, even though it follows at some distance. Niche or specialised products do not get as many users as the top players do but are deemed highly satisfactory by their more limited audiences. 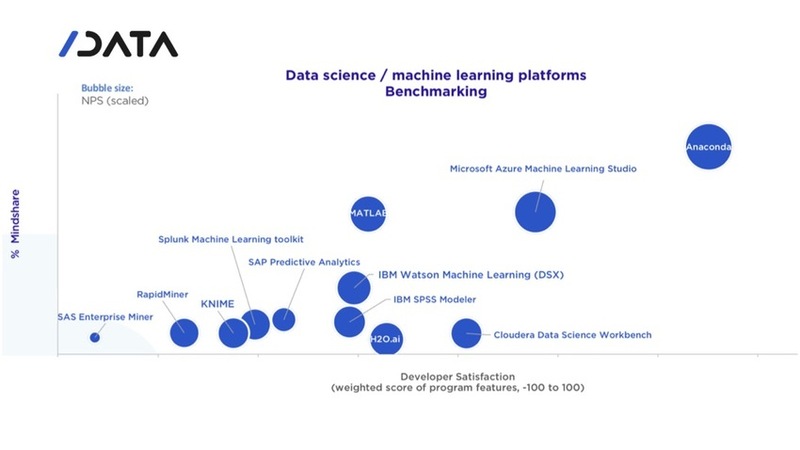 For instance, ML developers using Cloudera Data Science Workbench platform show higher levels of satisfaction and NPS than users of MATLAB, even though MATLAB’s mindshare is six times higher than Cloudera’s. This is good news for specialised platforms – as they already compete head-to-head with the leading platforms in terms of level of satisfaction with platform features, they have significant potential to increase their mindshare. For these platforms, it would be worth looking into different strategies that could lead to increased mindshare – from the right marketing message to adding more widely used features or providing more documentation and support. Mindshare for data science platforms is poised to change in the near future. Indeed, awareness for the top data science platforms remains relatively low with more than half of developers not being aware of most offerings. Furthermore, awareness does not always translate to usage. For example, IBM Watson Machine Learning and Anaconda have similar level of awareness (around 35% of ML developers), and yet Anaconda’s mindshare is three times higher than IBM Watson’s. This gap in usage stems, to a large extent, from developers who are aware of Watson ML but have never tried it. In summary, data science platform providers need to work on turning awareness into usage. If you enjoyed this post, our data science and machine learning Developer Satisfaction Tracker provides a more detailed deep dive into usage, awareness, reasons to adopt or reject a platform, satisfaction, and recommendation for the top data science platforms.